1 high-ranking music artist will be selected by Peter Leak for a one-on-one mentor session. Peter Leak currently manages Dido, Jessica Hoop and Lisse. He also co-manages Butterfly Boucher, Martha Wainwright and Terra Naomi. 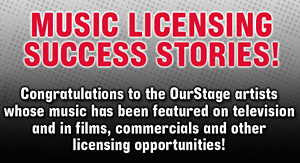 All high-ranking artists from April and May are eligible; Artist selection made jointly by Peter Leak and OurStage; Prizes will be awarded according to the OurStage monthly competition terms and conditions; No additional or travel expenses covered.